Artist Traci Talasco has maintained an active artist practice in New York City over the last 10 years and she is currently working on an installation that will be featured at the Brooklyn Arts Council. The installation “Rub Me the Wrong Way” will transform the gallery into a home environment created entirely out of sandpaper, which will wear down as you walk through the space. The title humorously refers to the unrealistic, societal expectations placed on women to “do it all”, and how we become worn down by our absurd attempts to juggle everything. Traci is reaching out to the public to support the realization of this installation and she’s getting very close. If you like the concept and would like to see it realized go to indiegogo to contribute financially. 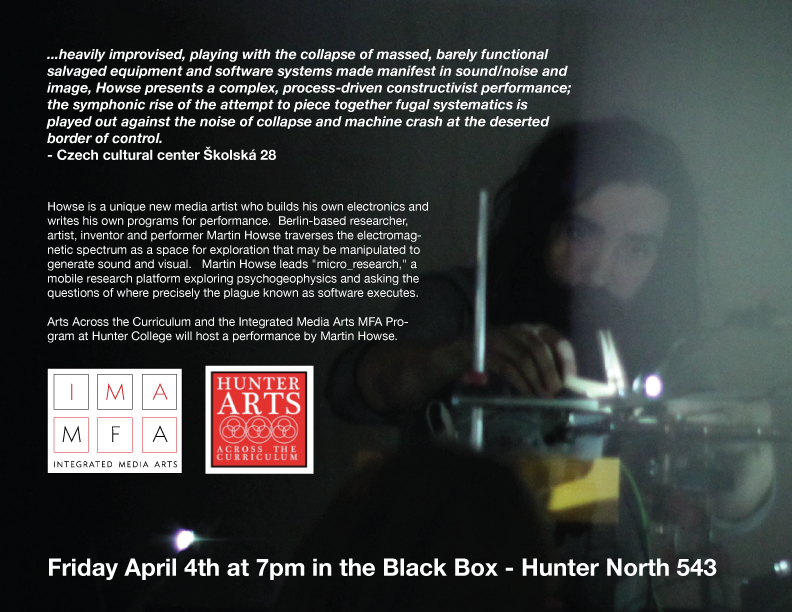 Arts Across the Curriculum and the Integrated Media Arts MFA Program at Hunter College will host a performance by Martin Howse on Friday April 4th at 7pm in the Black Box – Hunter North 543. Martin Howse is a unique new media artist who builds his own electronics and writes his own programs for performance. Berlin-based researcher, artist, inventor and performer Martin Howse traverses the electromagnetic spectrum as a space for exploration that may be manipulated to generate sound and visual. Martin Howse leads “micro_research,” a mobile research platform exploring psychogeophysics and asking the questions of where precisely the plague known as software executes.